Jeff Fenner's life is out of control. At the nadir of a rocky, sometimes-up-usually-down career, he has finally come face-to-face with his demons: he's being investigated by the police, he owes money to the wrong people, and he sees an empty future shutting down in front of him. When Jeff hears that his sister Marilyn has committed suicide, he refuses to believe she killed herself and he embarks on a tortuous journey toward self-discovery and redemption . . . and toward the beautiful but troubled Holly Barnes. Holly's own demons have led her to a self-help cult in Beverly Hills called Saving Our Lives (or, perhaps more appropriately, SOL). Through Holly, Jeff learns of a string of apparent suicides eerily similar to his sister sand that Holly is the next target. 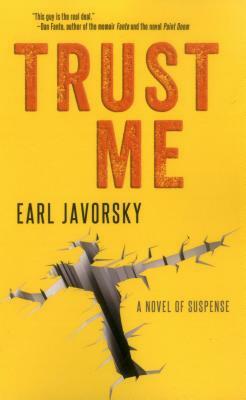 A fresh, bracing, surprising novel of suspense, TRUST ME further establishes Earl Javorsky as a thriller voice that demands to be heard. Earl Javorsky is the black sheep of his family of artistic high achievers. He is the author of one previous novel, DOWN SOLO.